Create a vintage look with . . .
Saltwash® powder is a base coat formula that gives a layered and textured effect when mixed with any brand or type of paint! Apply your mixture to any piece of furniture or surface to create a time-worn vintage look, in just a few easy steps. Follow the easy 3 step process and helpful tips to achieve your desired effect! With the 10oz Starter Kit, we'll send you everything you need to practice with and learn the application technique. So when you start your refinish project you're a pro at creating the weathered chippy look. The 42 oz can is sold singly. 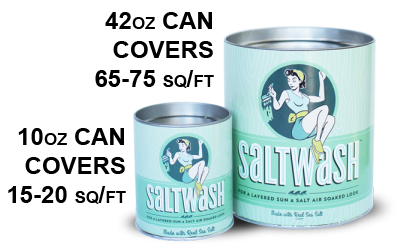 Saltwash® powder is made with real sea salt so you will notice it dries quickly and has great adhesion. It can be mixed into any brand, color or finish of paint and is always used as a base coat. When mixed to the desired consistency, Saltwash® can be applied to almost any surface that takes paint. Originally intended for furniture, Saltwash® can also give a unique look to walls, flooring, metal, glass, fabric and even plastic. I want to print the "How to Guide"
HOW DOES SALTWASH® POWDER WORK? Saltwash® powder is a patent pending product. Its chemical composition has an active ingredient that when added to paint and applied to any surface it begins to dry throughout all at one time. This differs from paint texturizing products and paint alone, which typically dry from top to bottom, resulting in the layers settling out. 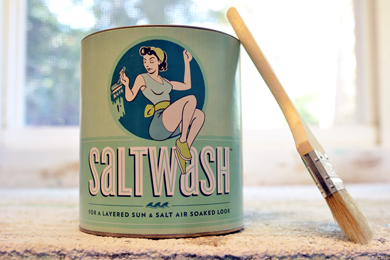 WHAT MAKES SALTWASH® POWDER DIFFERENT THAN TYPICAL CHALK PAINT OR OTHER SPECIALTY PAINTS? Saltwash® powder is not a paint but a paint accessory and is used as a base coat layer, for texture and authentic weathered worn look. 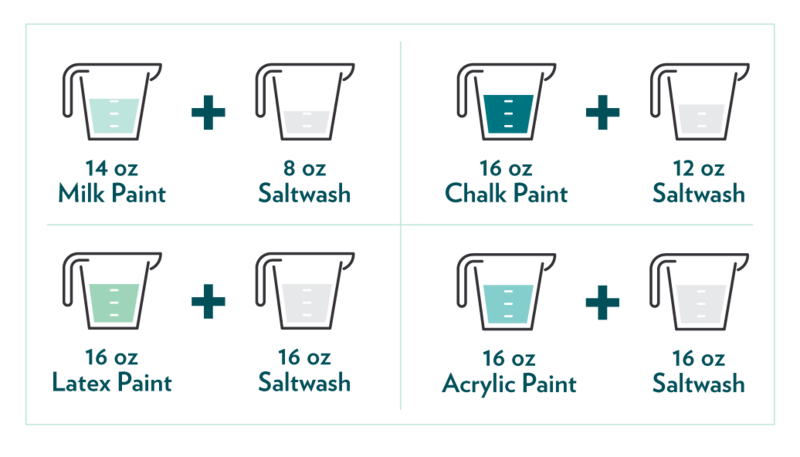 Saltwash® powder is used by mixing it into any type paint. WHAT TYPES OF SURFACES CAN SALTWASH® POWDER BE APPLIED ON? 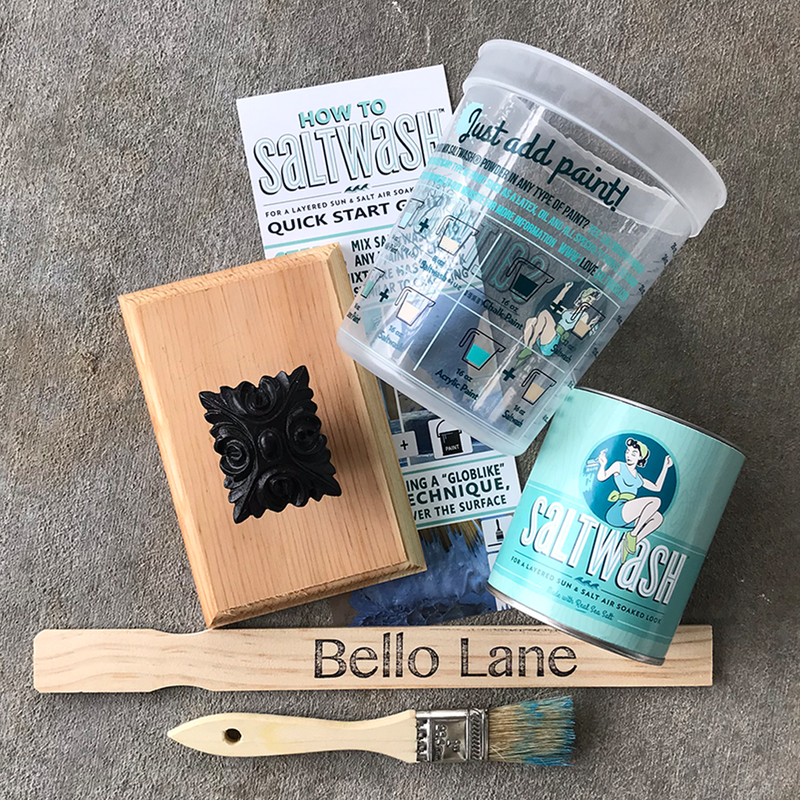 Saltwash® powder can be applied on wood, metal, ceramic, glass, plastic, cement, fabric and a variety of other surfaces, with no prep work required. WHAT MAKES SALTWASH® POWDER THE PREMIERE PAINT ACCESSORY ON THE MARKET? Saltwash® powder is the Original and only texturizing product on the market to use actual Sea Salt and all organic products!